Was the new Moto 360 spotted twice in as many days? Motorola looks to be having some problems keeping a lid on what is likely the new version of its Moto 360 smartwatch. 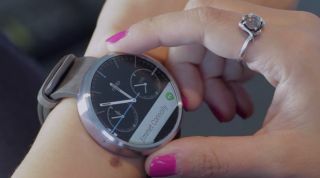 Less than a week ago, the company inadvertently showcased a new Moto 360 model in a tweeted promo video that was later deleted from the account. This time, the leaks come from users in and around Chicago, which happens to also be Motorola's home town. The first leak comes from Gerrit Gödecke, a Chicago commuter who posted two photos he took on his iPhone to his Google+ account, showing an all black model. "Looks to me like a Moto 360 with traditional lugs. It matches the renders that became available earlier (incl. the button on the right side that has been moved up to the 2 o'clock position)," he wrote in the post accompanying the photos. The second photo was posted online by a Reddit user, aptly named TheGuyWhoRuinedIt, and shows a dark red band that matches what we saw in the accidentally tweeted promo video, but this time, it shows a rose gold face rather than silver. "This photo was taken right behind the Merchandise Mart in Chicago today. She was walking down the street when I noticed the lugs and grabbed a pic," the user wrote on Reddit. Of course, we can't be sure that these are in fact the new Moto 360, but we have to say that if it is, the new smartwatch from Motorola is looking good.